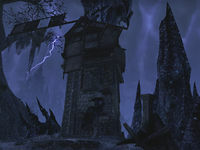 Deathspinner's Lair is the site of a ruined windmill in Coldharbour. Beneath the windmill is a special crafting site known as Cadwell's Crafting Cavern, where you may craft items in the Spectre's Eye set. This page was last modified on 16 February 2019, at 21:53.